Overlooking the fourth fairway of the Sandy Lane Golf Course, Happy Days commands glimpses of the Caribbean Sea. 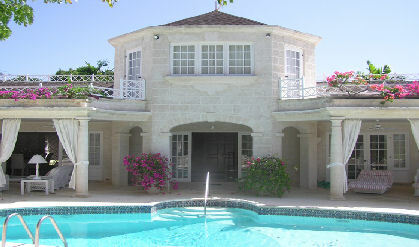 Grand and gracious in every aspect, this property was newly completed in 1990, and affords exceptional living. Only the ground floor of the house is available for rental, with the owners� first floor suite retained for their personal use only. A sweeping drive leads to the front of the house and its portico entrance. An impressive hall with cloakroom opens into a tastefully furnished lounge and dining room, and onto the spacious pool patio. In addition to the main pool there is a plunge pool/jaccuzi. There are three double bedrooms opening onto the terrace, and an additional guest can be comfortably accommodated in the music room where a bedsette folds down into a twin bed. This room also has a bathroom ensuite and leads onto the pool terrace. All the bedrooms are air-conditioned, with ensuite bathrooms. The villa comes fully equipped with cable television, and stereo system. Beautifully lawned landscaped gardens extend toward the private tennis court and its adjacent pavilion and sauna.